The further I dig in the ongoing story going on down in Lee County, Florida, the more I uncover unethical and corrupt behavior. I pointed out in my last report that the Florida Department of Law Enforcement issued a pretty pitiful report about a complaint filed by Deanna Williams concerning Lee County Sheriff Carmine Marceno and how they failed to deal with him based on their own standard of ethics. 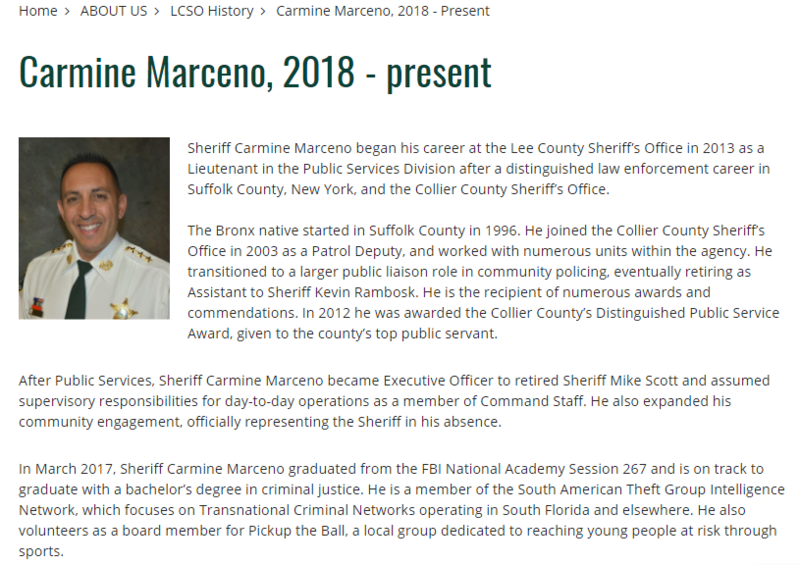 In the previous report before that, I informed the public that Marceno tells the public that he is “on track to graduate with a bachelor’s degree in criminal justice,” but the reality is that university records indicate he barely started the engine, and that was 15 years ago. First, one does not have to have a degree to be sheriff. In normal circumstances, a degree is helpful, but usually, experience over years and integrity during one’s service makes them qualified to run for the office of sheriff. 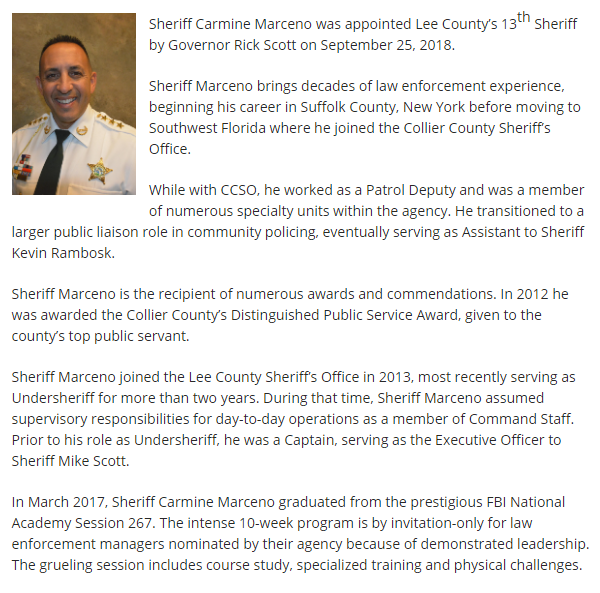 In the case of Lee County Sheriff Carmine Marceno, he was appointed last year by then Governor Rick Scott at the request of former Lee County Sheriff Mike Scott. This coming year will be Marceno’s first election. This is why things like perpetrating a fraud on the people of Lee County by telling them he is on track to receive a bachelor’s degree in criminal justice when he barely went to Florida Gulf Coast University for three months is nothing more than an attempt to boost his stature in the public eye. So, here is the evidence. This is a screenshot from the Lee County Sheriff’s Office history. Notice the first sentence in the last paragraph. This fraudulent claim was also allowed to run in last year in March at the News-Press.com and has never been updated despite the fact that I have informed the News-Press.com that he last attended FGCU in 2004. Marceno never corrected what they wrote. 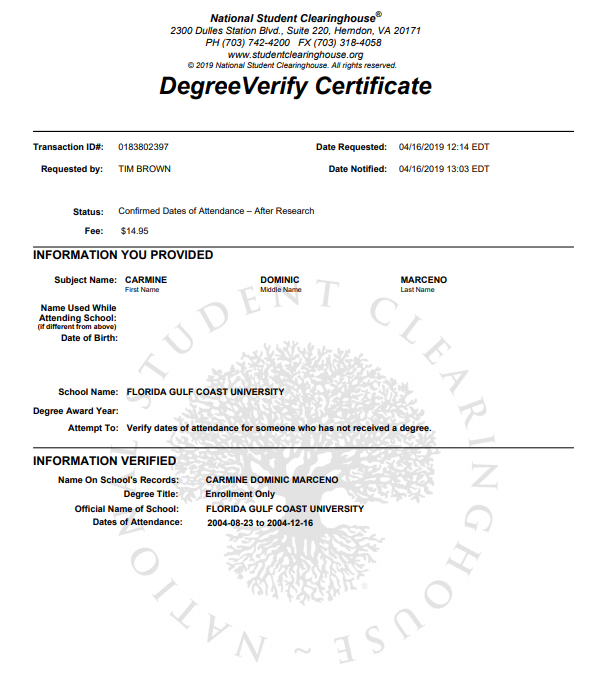 Now, here’s the evidence that Marceno is neither “on track to graduate with a bachelor’s degree in criminal justice” as the sheriff’s website declares nor is he “working on finishing his college degree from FGCU.” The following document was obtained by The Washington Standard via the National Student Clearinghouse. As you can see, Marceno attended the University a little over 3 months. Yet, he’s telling the people of Lee County a completely different story and the media is silent on what should be a huge political issue, which I’m sure those who will run against him for sheriff will capitalize on. However, that’s not all that is not the only fraud Sheriff Marceno has perpetrated on the people. In the next installment, you’ll see documents in which he provides false information to become a police officer, false information to become a deputy, failed two equivalency tests and apparently, according to Flordia law was impersonating a police officer for years as a result of that. What’s even more disturbing is that then-Governor Rick Scott, current Governor Ron DeSantis, the attorney general and Florida Department of Law Enforcement all had the information on Marceno that I will release and seemingly covered it up, or at the very least, swept it under the rug. Finally, as more of this is released, I want people to understand that I am well aware of the sheriff’s connections, and I would never do anything to harm myself or my family or anyone else nor would any member of my family. If anything happens to me or my family members, people will know where to look first. Previous articleLas Cruces, New Mexico Sanctuary City: Help Us We’re Overwhelmed!